The philosophy of culture paradigm is conducive to the communication between Chinese and Western philosophies and cultures. Philosophy of culture, a concept which originated in the 17th century, is a philosophical tradition that evolved from criticism of the modern philosophy of rationalism. It is a philosophical reflection on cultural phenomena. He Ping, a professor from the School of Philosophy at Wuhan University, said that the philosophical tradition considers human creativity and its products to be research objects, and national culture as the result of human experiences, revealing laws of cultural development and shedding light on the different development processes experienced by different nations. Since the 1990s, the emergence of the internet and the rising of discourse power have enabled cultural issues to permeate every aspect of international affairs and people’s daily lives. Therefore, the study of philosophy of culture has theoretical and practical significance in terms of understanding the modern world and history itself. Wang Guoyou, a professor from the School of Philosophy at Heilongjiang University, said the value of philosophy of culture lies in the fact that it uses culture as a breakthrough point to reflect on the existence of man, and to explore and solve the problems of man, so that philosophy transcends the research paradigm of traditional natural and spiritual philosophies. Hong Xiaonan, a professor from the School of Marxism at Dalian University of Technology, said philosophy of culture provides a new paradigm for philosophical research. This paradigm on the one hand is conducive to communication between Chinese and Western philosophies and cultures. On the other hand, it also helps break apart the barriers that surround domestic philosophical disciplines, leading philosophical research to a more open perspective. Philosophy of culture is a systematic and theoretical philosophical reflection on culture. So how does philosophy of culture understand the relationship between culture and philosophy? 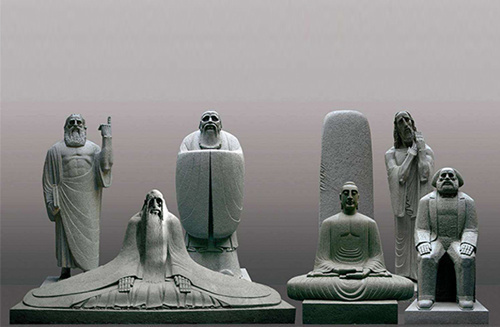 Hong believes that the relationship between culture and philosophy can be seen from two perspectives. First, the possibility of the so-called philosophical view on culture is mainly based on the question of “looking at culture from a philosophical perspective.” Second, the possibility of the so-called cultural view on philosophy mainly asks questions relating to “looking at philosophy from a cultural perspective.” In other words, it probes the differences between “culture as a philosophy”, “philosophy as a culture” and other forms of culture. This shows that “philosophy” and “culture” respectively constitute intrinsic and extrinsic aspects of human existence that correspond with each other and are isomorphic: Philosophy becomes the core of human culture, and culture is the carrier and representation of philosophy. Wang said in the view of philosophy of culture, on the one hand, culture is the research object of philosophy. Philosophy of culture is philosophical research on culture. Philosophy of culture embodies the object consciousness of philosophical research. In other words, when philosophy does not focus on the natural world, or the abstract spiritual world, but rather points to the cultural world of human beings, philosophy is delving into the practical basis of human existence and the possibility of infinite reflection. On the other hand, philosophy is an important paradigm of cultural studies. Philosophy of culture is a philosophical study of culture. This means that culturally oriented research may not necessarily be a study of philosophy of culture. Only when people reflect, criticize and ask questions about cultural concepts in a philosophical sense are they truly engaging in the study of philosophy of culture. Wang said that at present, China is transforming from a traditional agricultural culture to a modern industrial culture. At the same time, it is also facing the challenges of globalization. In a sense, current research on cultural theory still lags behind economic and social reform. There is still the major theoretical challenge of finding ways to rationally interpret, examine, and reflect on the cultural issues of contemporary China and form a self-conscious cultural theory that is in sync with the times. Hong said philosophy of culture can break through the limitations of philosophy and the barriers between disciplines, which will facilitate interdisciplinary research and integration of disciplines. How can we promote further development of Chinese philosophy of culture? Wang said that first, we should establish the research paradigm and the basic consensus of philosophy of culture. This is the basis for philosophy of culture to engage in dialogue, exchanges and gain social recognition. Second, we must face up to the realistic cultural issues and improve problem awareness. Awareness of the key problems is a characteristic of philosophy of culture. Third, we must promote dialogue and exchanges with other disciplines. Philosophy of culture should go beyond the abstract, speculative and theoretical deductions of philosophy, and strengthen exchanges with science, religion, ethics, literature, art, mythology, and daily life to obtain a rich foundation of life and theoretical resources.